Vetmedin for dogs is one of the most common medications prescribed by vets in cases where congestive heart failure is diagnosed. This drug improves the ability of your dog’s heart to pump effectively and efficiently, and does not work the same as most other heart medications. With congestive heart failure in dogs the ability of the heart to function properly is compromised, and drugs may be needed to correct this problem. Vetmedin for dogs reduces the effort needed by your pet’s heart to pump blood to and from this organ, and lowers the pressure as well. This can mean a longer and higher quality of life, so your pet stays healthier and more active. Pimobendan for dogs is the generic form of Vetmedin, and this means that the same active ingredients are found in both medications but one will cost less than the other. Some pet owners prefer a name brand medication though, and in this situation Vetmedin may be the best choice if congestive heart failure is diagnosed. 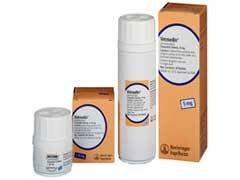 Vetmedin for dogs is very effective in most cases, and can prolong the life of your pet significantly. There are other medications that may be used by your vet instead, if Vetmedin is not recommended for any reason, and these can include Benazepril for dogs and a number of other drugs. Your vet will determine if Vetmedin for dogs is the right choice of medication after your pet’s condition, medical history, and other relevant factors are evaluated. While this drug works well in many cases it may not be the best choice for some dogs due to other medical conditions such as allergies or limited organ functioning in your pet. The Vetmedin side effects can include serious possible risks, but without treatment for congestive heart failure this condition can be fatal much sooner, as well as affecting the quality of life that your pet enjoys.